Today’s human resources leaders face a unique and fluid environment when it comes to hiring and managing an organization’s workforce. In our fast-paced business world, complex legal landscape and a changing job market, HR departments will need to Rise Up more than ever to meet these demands. Join hundreds of HR professionals from your community to learn how you can be better prepared to lead through your challenges. The NOLA SHRM 2018 Annual Conference and Exposition will take place on Friday, September 14th, at the New Orleans Downtown Marriott Convention Center with a fully packed lineup featuring amazing general sessions and informative breakout sessions. Attendees can earn up to 6 credit hours towards their SHRM and/or HRCI recertification. Act Now to take advantage of Early-Bird Pricing that will be good through August 14th! 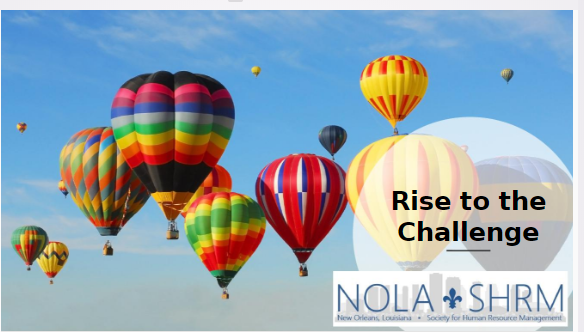 Click here to see the vendors that support NOLA SHRM!